Bad dreams, everybody has them. Sometimes they stick with you throughout the day, making it hard to concentrate. Like the first slumber party I went to and some genius suggested that we watch “Poltergeist”. Nightmares are a common occurrence and their effects are universal. It is no wonder that in Japan and China bad dream equals bad luck for the dreamer. Fortunately, they know what to do to prevent this. Call on the baku. 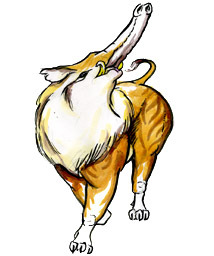 The baku is a creature of spirit, a chimera that eats bad dreams. Talk about a specialized skill set! Oddly, it’s ugly enough to cause me nightmares. Many tales say the baku resembles a tapir. A what? I know, I had to look it up. I’ll save you the hassle. Tapirs are a roughly pig-like mammal found in Central America, South America, and Southeast Asia. Others describe it as having a large body like an ox, a long snout like an elephant, with tiger’s limbs, an ox tail, and small rodent-like eyes. There’s a variant where the body is more like a bear, with all the same features as before. Still other tales describe the baku as having spines on its back, sharp pointy teeth, an elephant’s trunk and tusks, and a lion’s mane. Are you confused yet? Don’t worry, more important than what a baku looks like is what it does. If you want to try to prevent bad dreams, keep an image of a baku in your bedroom. Some people write the baku’s name on a piece of paper and put it under their pillows before bedtime. Others take no chances and write the baku’s name on the pillow itself! Of course, if you are concerned, you can set up an altar to the baku in your bedroom. There you can leave small gifts and offerings to him to insure pleasant dreams. How wonderful is it that such an odd, and perhaps scary looking creature can in fact help humans with their nightmares? Perhaps the baku is so frightening looking that nightmares dare not show up. No matter why it happens, the baku is a benevolent creature, if unusual looking being. Pleasant dreams.